Shagway Arts Barn...Local Art, Live Music, and Craft Shows! by over 30 different local artists. Shagway Arts Barn, LLC, is a family owned company dedicated to expanding the cultural and economic growth of Mason County. Opened on July 18th, 2014, the beautifully restored 1920s-era barn attracts local artists to create, display and perform their works of art from visual art to musical performances. Guests enjoy exploring the treasures of the barn with its loft and balcony, roaming the many trails through the surrounding fields and woods, and getting a peek at the 'Log Inn' and granary. Tourists and residents alike are attracted to the scenic setting, the historic architecture and the unique art. The Arts Barn is also part of the Mason County Quilt Trail. 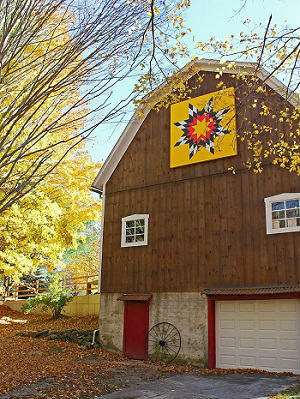 You can see the beautiful painted 'Blazing Star' quilt hung at the front of the barn, created in honor of Henry Shagway of the Ottawa tribe, who built the granary, barn and 'Log Inn' cabin on this 40 acre, wooded property from 1900 to 1920. Shagway Arts Barn offers so many fun activities, and the sky is the limit! Inside the Barn, the gallery features over 25 local artists who showcase and have their art available to purchase. With so many different kinds of art, including photography, crafts, quilting, pottery, drawings, and paintings, it's the perfect selection for great gifts and treasures! Occasionally during the summer, the Arts Barn also offers art classes taught by some of the Arts Barn artists. Call the barn for current information. The 40 acres of land that the barn sits on includes beautiful nature trails through fields and woods that house wildlife. Marked trails are available to explore for free...pets are welcome as long as they are on a leash and cleaned up after. periodically through the summer months. 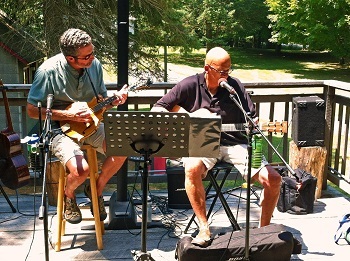 The Arts Barn also hosts concerts on the deck by local musicians throughout the summer months. Alcohol is permitted but not inside the barn. There is a $5 cover charge for concerts. Children 12 & under are free. Credit cards, cash or checks are accepted. Visit the Shagway Arts Barn Facebook page or their website for updated information. Shagway Arts Barn Hosts Monthly Outdoor Craft & Vendor Shows! As if there wasn't enough of a reason to visit the Arts Barn already, now you can look forward to craft & vendor shows every month at the Arts Barn! The craft & vendor shows are outdoors next to the Barn, and run from 10am-4pm. The 2018 dates are June 9, July 28, August 25, September 15, and October 20. You can expect to see many handmade treasures including crafts, home decor, paintings, sketches, and much more. There will also be vendors selling their products at the shows. For more information, or to fill out an application to be a vendor, visit the Shagway Arts Barn website. The Barn and many of the surrounding areas are handicap accessible, as well as the restroom on site. There is so much room to roam, and the sky really is the limit at the Arts Barn. If you have something in mind, just ask owner Nancy Miller, who will be very happy to help host your idea or event! The Arts Barn and property can also host weddings and other special events! The Barn deck is the perfect spot for a small, rustic wedding ceremony, or take it outdoors in one of the many fields for more space! For pricing and more information, visit their website. Shagway Arts Barn property in the early 1900s. Initially, the 40 acres of land on the southeast corner of Sherman and Shagway Roads, were owned by Charles Mears and used for lumbering. They passed through several owners, largely undeveloped, until Henry Shagway purchased them in November 1898 for $100. Soon after buying the land, Henry, with the help of his uncle, Pete Espiew, built a cabin and barn - they both burned down a few years later! A new cabin was built, from logs cut on this very property. Henry built a large barn and kept horses and cows. He cultivated half the 40 acres, pastured some, and allowed about five acres to remain in woods. 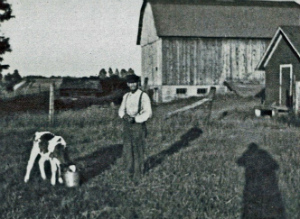 He supplied neighbors and resort stayers with milk and other farm products, plus hunted, fished and trapped. After Henry’s death in 1953, the 40 acres became part of his estate and were sold to the Gregory family in 1954. The Gregorys made many changes to the property including moving the original cabin to its current location, building a new home, and improving the other buildings on the property including the barn, which is now over 80 years old. They rented the cabin to vacationers during much of the summer. This had been continued by Katherine and Don Miller, who acquired the property in 1967. After the death of Don in 1996, his son, Paul Miller, inherited the property. Katherine and Don had hoped that the property would continue to be enjoyed and shared for generations to come. Shagway Arts Barn is open Thursday through Sunday from 12pm-8pm Memorial Day weekend through Halloween weekend. Shagway Arts Barn is located just 7 miles north of Ludington (take Jebavy Drive north, turn left on Shagway Rd. after 7 miles, and the Arts Barn is just down the road on the left!) For more specific driving directions and a map to the Barn, click here.